Stress is the body's natural response to demands placed upon it. This response affects children, teenagers, and adults. Relaxation and stress management techniques help people deal with stress. Everyone experiences stress, which is the body's general response to any event, real or imagined, that requires an adaptation or extra effort. In most cases, an event or situation is not stressful by itself. Rather, it is how people view the event and what they believe about their own ability to respond to it that create stress. About 10 percent of modern stress can be linked to actual physical threats to life or safety, such as being threatened with a weapon or needing to slam on the brakes to avoid an accident. The other 90 percent of stress seems to result from our perceptions of life events, such as fights with friends or family, worries about school or work, or problems we do not know how to solve. The majority of doctor visits are believed to be stress-related. Physical stressors affect a person's body. These biological stressors may include exercise, illness, or disabilities. Environmental stressors include noise, overcrowding, poverty, natural disasters, or even technology that causes too much change in too short a period of time. Life situations create both good and bad stressors. These may include moving to a new home, changing schools or jobs, or experiencing changes in the family structure, such as marriage, divorce, the birth or adoption of a new sibling, or the death of a friend or family member. Behaviors also can be stressors. These may include smoking cigarettes, taking drugs, not sleeping enough, eating too little or too much, or exercising too little or too much. Certain patterns of thinking (cognitive actions) can be stressors, too. These may include fearing change or challenge, remembering hard times that have passed, interpreting minor losses as catastrophes, or having too little self-esteem. Most often, stress is associated with negative events or thoughts, which are difficult experiences that most people find unpleasant, frightening, or anxiety-producing. Stress may result from teasing by peers, being bullied, anxiety about homework or tests, disappointment about not achieving a goal, encountering unfamiliar people or places, or efforts to cram too many activities into too little time. Job stress and caregiver stress often fall into this category. So does being a pessimist and "worrywart" who believes that whenever something can go wrong, it will go wrong. Stress is the body's natural response to the difficult demands it encounters everyday. Take a deep breath when faced with stress, and sometimes anxiety turns into excitement. That is because some stressors are positive. An audition, a stage performance or applause (instead of stage fright), an A grade or a game point (instead of anxiety), or a date to the prom with someone brand-new are positive stressors. Stress also is the body's natural response to the exciting new challenges it encounters everyday. Some events are so stressful that they overwhelm us, and no amount of deep breathing or positive thinking can help. Accidents, injuries, abuse, violence, war, serious threats to physical safety, or the sudden death of a loved one are examples of traumas that cause a stress response within the body. Stressors good and bad set off a series of events within the body's neuroendocrine system. Often called the "fight or flight" response, these events are triggered by the brain, which alerts the body's autonomic nervous system to prepare all systems to react to an emergency. The autonomic nervous system sends a message in a split second through nerve fibers, which signal all the other body systems. During this alarm period, many different hormones are activated with many dramatic effects on other body systems. The heart beats faster, blood pressure is raised, and blood vessels dilate (open wider) to increase blood flow to the muscles. The pupils dilate to aid vision. The digestive system slows down so that the body's resources and energy can be used wherever else they are needed, and the production of saliva decreases. The bronchi dilate to aid breathing. The skin sweats to cool the body, and the liver releases its stores of glucose, the major fuel of the body, to increase the person's energy level. The body stays in overdrive until the brain tells it that the emergency has ended. Events that trigger the stress response usually are emergencies that do not last for very long. This allows the body to relax and recover after the emergency has ended so that it can respond correctly the next time its emergency response system is needed. Don't expect others to be perfect. 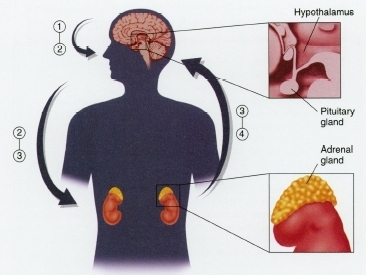 The body's stress hormone response: When the brain perceives stress, the hypothalamus releases corticotropin-releasing factor (1), which triggers the release of adrenocorticotropin (ACTH) (2) from the pituitary gland. ACTH (2) travels through the bloodstream and (along with signals from the brain sent through the autonomic nervous system) stimulates the adrenal glands to release cortisol and epinephrine into the bloodstream (3). Cortisol and epinephrine (3) help provide energy, oxygen, and stimulation to the heart, the brain, and other muscles and organs (4) to support the body's response to stress. When the brain perceives that the stress has ended, it allows hormone levels to return to their baseline values. stress response system activated at too high a level or for too long a period of time. This may interfere with the body's ability to recover from the stress response. Chronic stress or post-trauma stress also may lead to physical, emotional, or behavioral problems, post-traumatic stress disorder, or even the development of stress-related illnesses. What Happens with Too Much Stress? Dr. Hans Selye of the University of Montreal is considered the founder of modern stress research. Chronic stress is believed to be a factor in many cases of abuse, violence, and suicide. Over the long term, chronic stress also may contribute to the development of cardiovascular problems, such as high blood pressure, heart disease, and stroke. People who experience chronic stress can benefit from working with a doctor or therapist to learn stress management techniques. What Is the Antidote for Too Much Stress? The antidote for stress is relaxation, creating a state of ease, rest, and repose within the body. Taking a deep breath almost always is the first step toward relaxation, allowing us to figure out that the emergency that triggered the body's stress response has ended. 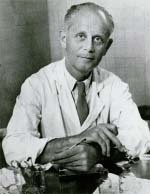 Dr. Hans Selye (1907-1982) is considered the founder of modern stress research. He authored 39 books, wrote more than 1,700 scholarly papers, and was cited as a source in more than 362,000 scientific papers, not to mention countless articles in magazines and newspapers around the world. He also established the International Institute on Stress at the University of Montreal. The body's "general adaptation syndrome" often is called "Selye syndrome." Dr. Selye defined stress as "the nonspecific response of the body to any demand," which means the body's reaction to any change in its environment. Dr. Selye linked physical illnesses not just to bacterial and viral infections, but also to hormones within the body that become activated whenever the body responds to external stressors, such as temperature extremes, pain, and threats to safety. Dr. Selye determined that, many of the body's hormonal responses to stress were helpful and "adaptive," but others were "maladaptive" and placed physical demands on the body that could result in disease. Still, Dr. Selye described stress as the spice of life, which might make one person sick while invigorating another. In one of his best-selling books, The Stress of Life, Dr. Selye offered this rhymed advice: "Fight for your highest attainable aim/But never put up resistance in vain." By choosing wisely where we invest effort and emotional energy, we can reduce the damaging side effects of stress, keep distress to a minimum, and increase our enjoyment of life. At the end of a stress response cycle, the body begins a relaxation response: Our breathing slows down, our hearts stop racing, our muscles stretch out, our minds become quieter, and levels of stress hormones in our bodies return to their baseline values. Techniques for achieving a relaxation response are many and varied. Some people listen to music or sing, go for a long walk or a run in the park, or practice meditation. Other techniques that promote a relaxation response include yoga, abdominal breathing, progressive muscle relaxation, biofeedback, guided imagery or visualization, hypnosis, prayer, support groups, or spending time with pets or loved ones. Because stress is an inevitable part of living, the long-term antidote for stress is to learn coping strategies that allow us to live with it successfully. They view change as a challenging and normal part of life, rather than as a threat. They have a sense of control over their lives, they believe that setbacks are temporary, and they believe that they will succeed if they work toward their goals. They have commitments to work, family, friends, support networks, and regular activities that promote relaxation, including hobbies, vacations, sports, yoga, and meditation. Some people seem to be born with resilient personalities and good stress management skills. They know instinctively how to "get by with a little help from their friends." However, at times when a little help is not enough and only extra-strength help will do, or when a person needs some coaching to improve coping skills, it is always a good idea to turn to a doctor, counselor, or therapist. Dr. Herbert Benson of Harvard coined the term "relaxation response" for the body's antidote to its stress response. Triggered by a 20-minute period of meditation, the relaxation response leads to decreases in heart rate, breathing rate, blood pressure, muscle tension, metabolic rate, oxygen consumption, lactic acid production, and anxious thoughts. To achieve the relaxation response, Dr. Benson recommended a quiet environment, a comfortable position, a focal point (a repeated word or sound, such as "Om"), and a passive attitude toward distracting thoughts that enter the mind. American Institute of Stress, 124 Park Avenue, Yonkers, NY 10703. This organization publishes the newsletter Health and Stress and provides informational packets about job stress, holiday stress, stress management, and other topics. International Stress Management Association. This organization publishes the International Journal of Stress Management for professionals. Its website features stress inventories, Internet links, and other resources. Stress Management Briefs. These fact sheets on children and stress, coping with change and loss, occupational stress, identifying stress factors, and other topics are provided by the University of Minnesota Extension Service. Have you ever had times when everything feels like a drag and you hate to get up in the morning, get dressed, go to work, do whatever you have to, run your errands, take care of children, do housekeeping, and so on and so forth? It doesnâ€™t help if it is a lovely sunny day, you feel gray and cloudy. You feel so bad that you donâ€™t even want to feel better. You may also be so stressed you canâ€™t even think straight. Your mind spins; you are not in control.